Mardi Michels is a full-time French teacher to elementary school-aged boys and the author of eat. live. travel. write - a blog focusing on culinary adventures near and far. She has lived and worked as a teacher in Australia, Hong Kong, England, France and now calls Toronto home. As part of her job, she runs a cooking class twice a week for 7-13 year-old boys, Les Petits Chefs and Cooking Basics. She’s also a cook, baker, traveler, photographer, writer, Food Bloggers of Canada co-founder, Food Revolution Day Ambassador for Toronto and in her spare time (!) teaches French pastry classes (focusing on macarons) around Toronto. Hi, I’m Mardi, author of the blog eat. live. travel. write. and I am honoured to be contributing the official PINK recipe for 2013. This year, I’ve updated a dish that always makes me feel a little nostalgic – tomates farcies. What's that you ask? Well, when I was an exchange student living in Belgium, one of my host mothers' specialties was tomatoes stuffed with a delicious mix of pork and beef mince and baked until tender – so tasty and warming on a cold winters' day. This recipe is a meatless version of this dish, with mushrooms as the star and works well in the warmer weather too. It's also quick and easy to prepare and very versatile – I’ve included the vegetables I usually use with this, although you could just use what's on hand. Slice the tops off the tomatoes, reserve these as "lids." Scoop out the flesh and juice of the tomatoes into a bowl and mash until pulpy. Set aside. Sprinkle the inside of the tomatoes with the salt and turn upside down on a paper towel to drain excess juice. Set aside. Heat the oil in a large frypan over medium-high heat and sauté the mushrooms, zucchini and herbes de Provence until "al dente" (you’re going to cook this mixture again in the oven so you don’t want to overcook at this point). Add the reserved tomato flesh and the pearl barley/ wheat berries and stir to thoroughly combine. Add the egg and Parmesan, stir well and remove from the heat. Rinse the salt out of the tomato halves and pat dry with a paper towel. Fill the tomato halves with the mushroom mixture – packing tightly by pressing on the mixture with the back of a soup spoon. Place the tomato halves on a baking tray lined with parchment paper. Place the tomato tops on each tomato, sprinkle with a little olive oil and bake for approximately 30-40 minutes until the filling is hot and the tomato flesh is slightly softened. 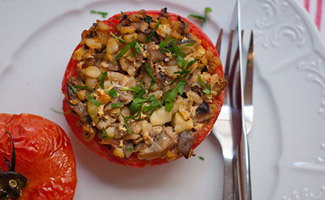 Optional: you can remove the tops from the tomatoes and sprinkle with some fresh herbs, replacing the tops to serve. 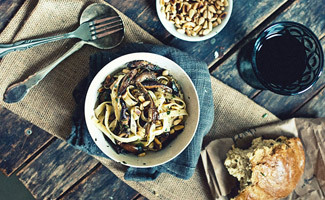 Louisa is the writer, recipe developer and photographer behind the Canadian food blog Living Lou. She is passionate about leading a healthy lifestyle and creates simple, healthy and nutritious recipes to inspire others to follow suit. Living Lou was chosen as Psychology of Eating's Top 100 healthy blogs of 2012 as well as Jamie Oliver's Food Revolution Blog of the Month. In a large pan, heat olive oil over medium heat. Add onion and bacon, sauté for 3-5 minutes. Add garlic, cook for another minute or until fragrant. Next, add butter, mushrooms, and fresh thyme. Sauce for 3 minutes or until mushrooms begin to cook down. Finally, add the white wine, cooking for 3-5 minutes, then add the cream and simmer for 2-4 minutes or until sauce has thickened up. Remove sprigs of thyme and serve over pasta. Kelly is a food writer and photographer based in Ottawa. She’s passionate about local fare, bright flavours and whole food recipes. Through her blog, The Gouda Life, she shows apprehensive cooks that making simple meals and dishes for yourself and your family is attainable and rewarding. Bring a large pot of generously-salted (very important as this dish is so simple) water to a boil and cook pasta to just under al dente according to package instructions. If the package says 9 minutes, take out around 7. Reserve 1 cup of starchy pasta water before straining. 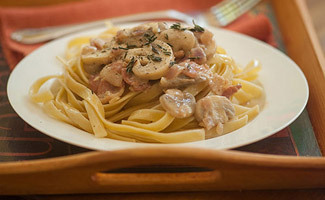 In a dry, heavy-bottom skillet set over medium-high heat, brown mushrooms in batches until golden and crisp. I browned each variety of mushroom on its own as they may have different moisture levels. It should take about 6-7 minutes per batch to get them nice and golden - don't rush this part. It's the big flavour maker! Once all your mushrooms have been browned, remove everything from the pan. Add the butter and olive oil to pan and let it get shimmering and hot. Add the garlic and let it cook until fragrant, 1 minute. Add the mushrooms, parsley and red pepper flakes and sauté until everything is combined, 1-2 minutes. Remove from heat. Strain pasta (don't forget to reserve 1 cup starchy water), and add back to large pot. Scoop the mushroom mixture into the pasta, making sure to really scrape all the good bits from the pan, with the Parmesan cheese and 1/4 cup of starch water and toss. If it's too dry, add more water a little at a time until you've got a nice, loose mushroom sauce coating all the noodles. Taste for seasoning and add salt if needed. Garnish each serving with pine nuts, extra cheese, parsley and fresh ground pepper. Kathy is one part cook, one part food blogger, one part cooking instructor, one part aspiring restaurateur, and all parts obsessed. Blossoming in the woods of Northern Ontario where she began a career as a planting cook, her obsession with food has grown to monumental heights. If she’s not spending hours in the kitchen cooking up some pork, she's crossing a restaurant off her never-ending list of places to eat in Halifax, Nova Scotia. Catch all the delicious action at http://eathalifax.ca. Being mad obsessed with all things Mexican as of late, what better way to showcase some mushrooms than sandwiched between two tortillas. 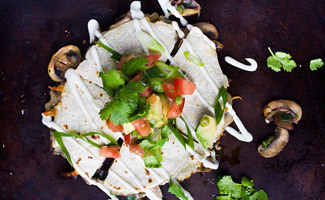 Bursting with seasoned mushrooms and gooey cheese then smothered in a zesty lime cream, these quesadillas may just have you jumping on board with Meatless Monday. Prepare lime crema by combining all ingredients. Set aside. Melt butter in a skillet over medium-high heat. Sauté onions til starting to become translucent, about 3 min. Add mushrooms, jalapeno, and garlic. Add a good pinch of salt and pepper. Cook til mushrooms release juices then start to brown, about 5 min. Add cilantro. Remove from heat. Heat a cast iron skillet over medium heat. Add a tortilla. layer with ¼ cup Monterey Jack, ¼ of the mushrooms, 1 tablespoon Feta, then another ¼ cup Monterey jack cheese. Top with a second tortilla. Cook until crisp and browned on both sides. 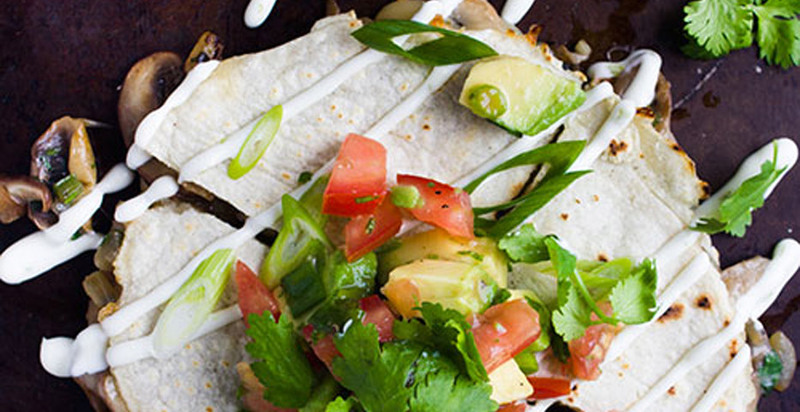 Slice and serve with lime crema, green onions. cilantro, and salsa of choice. If desired amp up the heat by replacing jalapeno with a hotter variety or serving with a hot salsa. Jenny, a self-confessed sugar addict, is the enthusiastic blogger behind The Brunette Baker. When she's not baking, you can find her spending time with her incredible husband and two amazing kids. In a large skillet, heat 1 tablespoon of unsalted butter and 1 tablespoon canola oil over medium heat. Add onions and cook for several minutes until translucent. Add in uncooked Arborio rice and stir, allowing butter and oil to completely coat the rice. Sauté for a couple minutes or until rice begins to release a nutty aroma. Add white wine and stir until the rice has completely absorbed the liquid. Add the mushrooms and a cup of hot broth, stirring constantly until liquid is absorbed. Continue this process until the rice takes on a creamy consistency and the starches begin to release. Rice should be al dente; tender, but firm to the bite. Add butter, cheese, and salt; stir until melted. Refrigerate risotto for several hours or overnight for best results. With dampened hands, form risotto into 1 or 2 inch balls, depending how large you would like them. Stuff a cube of mozzarella inside, squeeze firmly, and then roll in breadcrumbs. In a deep saucepan, fill pan with enough canola oil to cover risotto balls and heat to 365ºF. 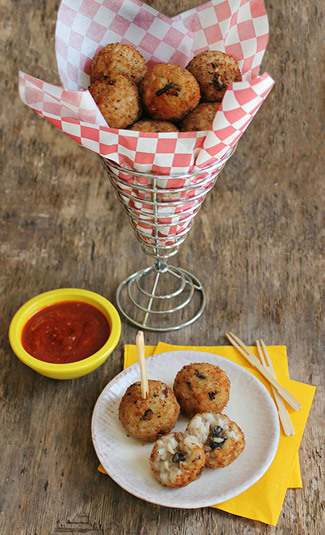 Place balls into hot oil, two at a time, frying until they turn golden brown and cooked throughout – about 2 minutes. Using a slotted spoon, remove from oil and transfer to a paper towel-lined plate. Serve warm with a side of marinara sauce. Isabelle is the cook, photographer, writer and chief bottle washer over at Crumb: A Food Blog. She believes in cooking from scratch with fresh seasonal ingredients, in baking with shameless quantities of butter, and in bribing someone else do the dishes afterwards. When she's not busy cooking, eating or taking pictures of her food, you’ll usually find her reading a book with a cat on her lap or catching up on the latest episode of Glee. Preheat oven to 400F. Lightly butter four large oven-safe ramekins, and arrange on a baking sheet. In a large saute pan set over medium-high heat, sauté the mushrooms in butter until soft and lightly browned, about 5 minutes. Add the sherry and thyme, and continue cooking for 2-3 minutes or until most of the sherry has evaporated. Remove from heat and season to taste with salt and pepper. Spoon the sauteed mushrooms into the prepared ramekins, dividing evenly, then gently crack an egg into each one. Top with 1 tbsp cream and 1 tbsp grated Parmesan. Bake in preheated oven until the egg whites are set and the yolks are done to your liking, about 10-15 minutes. 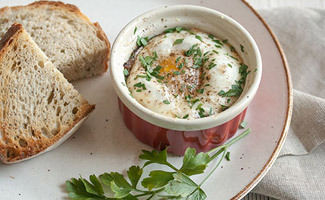 Serve immediately with a sprinkling of chopped parsley and thick slices of toast for dunking. Charmian Christie is a food writer, recipe developer, blogger and soon-to-be cookbook author. Her first cookbook, The Messy Baker, is due on shelves in 2014. A strong supporter of Canadian food and food culture, Charmian loves creating delicious and accessible ways to enjoy fresh, local ingredients - especially mushrooms. Her passion for mushrooms is so strong, friends suspect she's part hobbit. I nearly failed mushroom growing 101, despite using a kit designed for kids. After an impressively strong start, I neglected the project and returned to find, dried, leathery mushrooms where large, soft, ruffled ones once grew. Out of desperation, I rehydrated them. They sprung back to life. 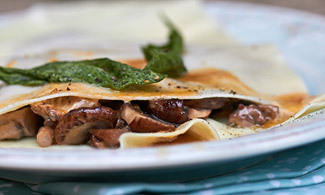 I was so excited by the resurrected crop, I created an open-air version of mushroom ravioli to celebrate. Not only does this unsealed approach make the ravioli easy to prepare, you get a higher mushroom-to-pasta ratio than with the traditional form, which is yet another reason for celebration.